Giveaway Closed. Congrats to FFC reader, Samantha. Check your email Samantha for details! Oh I love Fall – sweaters, cool air after a HOT Summer, and CTC is back up and running! That’s right, the Children’s Theatre of Cincinnati returns for another blockbuster season to please young and old alike. And the season starts with a classic I can’t wait to see. The Wizard of Oz opens on Friday (10/14) and with sell outs all year last year, you’ll want to move fast to make sure you don’t miss out. The beauty of CTC is that children can begin their appreciation of live theater young, in an environment that is totally kid-friendly. The shows are top notch and enjoyable for the whole family. This will be my family’s third year as loyal fans and it is one of my favorite things about Cincinnati. The whole season at CTC is going to be fantastic: after Oz there will be the third edition of Holiday Follies in December, Disney’s My Son Pinocchio in February and the season wraps up with Rapunzel in March. I can’t pick a favorite! And when you can get tickets for as little as $7 for each show – you don’t need to! You can find out more information on their site and order tickets. Believe me, sell outs will happen – it’s the hot ticket for kiddos – so don’t delay! We’re partnering with CTC again this year to give a family four pack of tickets to the 5pm performance of Wizard of Oz on Saturday, October 22nd. To enter to win, leave a comment here telling us which Oz character you would be and why. Earn a second entry after you do the first by going to CTC’s Facebook Page and liking them so you don’t miss out on any of their news. Come back here and leave a second comment telling us you did so. Earn a THIRD, yes THIRD entry by becoming a subscriber and leaving a comment. If you already are great – leave a comment letting us know. We’ll draw a winner on FRIDAY – OCTOBER 14th at 4:56 pm! Good luck and for our friends at Children’s Theatre: BREAK A LEG! i wish this song was longer and yes i mean? the actual song not the 2 whole minutes of introduction haha. I’m a huge Wizard of Oz fan. We went and saw this tonight. Since we moved here from NY, we have gone to Cincinnati Children’s Theater for about 4 years now. It was not the same quality of shows as they usually produce. It was good, but you can tell they’ve changed management. It is a decent show. However, it is not the typical Wizard of Oz play from any stage version I’ve seen. There were some funny moments. Staging and dancing was weak. Acting was good. Singing was so so. Set was really nice, though. HEADS UP FOR THOSE WITH VERY SMALL CHILDREN– When they meet the wizard, it can get a bit scary for little ones. My 11 and 13 year old seemed to enjoy it and they’ve seen the Wizard of Oz 3 or 4 times already. / I would be Glinda because she flies around in a bubble! Already subscribe to FFC…it would be awesome to take the girls. Dorothy….my granddaughters adore Dorothy so it would only be fitting to be a wonderful Dorothy for them. They have the clothes, shoes and all and have memorized the movie. Glenda the good witch, all things nice!!!!! I would want to be Glenda ~ because she is the good witch! I would be the Scarecrow. He is a great friend, loyal, and determined. I would be dorothy because I have a huge heart and love to sing!!! I would absolutely be Toto. Not only are you the true impetus for the entire saga, but you get to look unbearably cute in a basket. And finally Toto reveals the Wizard to be a fraud. Toto rocks!! Done. Done. and Done! That’s three! Liked the CTC Facebook page! I just “liked” CTC’s Facebook page. Crossing my fingers! I’d like to be Glenda the Good Witch. Almost everyone likes her. I would be the Wicked Witch of the West just so I could say, “I’ll get you my pretty….and your little dog too”! Adore this movie! I liked CTC’s facebook page. I would be Dorothy to wear the “red shoes”. I would be the Lion because he is loyal. I follow CTC on Facebook. I subscribe to Family Friendly Cincinnati! I follow CTC on Facebook! Dorothy because I like her cute, shiny shoes! LOL. The Scarecrow because he was funny. I would want to be Glinda. I always thought she was beautiful. I loked CTC on Facebook. I “liked” CTC on Facebook! I would be Dorothy – meet the people she befriended. I would be Toto because he just gets to tag along. I would love to be the lion, he just seems so darn friendly and fun-loving. I would love to see a show with my daughter. I would choose Dorothy because she was cute and loved her dog. Glenda the good witch, because she’s so sweet. If I could be an Oz character, I would be Dorothy … to go on the adventure she went on and meet the people she met. And the ruby slippers of course. I became a fan of CTC on Facebook! I am already a subscriber. 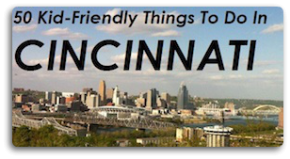 Family Friendly Cincinnati is a website that I follow all the time. I liked CTC on Facebook! I asked my family which character, and we decided on the Tin Man! Because Oz never gave anything to the tin man he didn’t already have. I would be Dorothy..love those shoes!! I would like to be the Wicked witch since it would be fun to be wicked for a little while and get away with it. Plus, she gets to hang with the flying monkeys! CTC like for a long time! Auntie Em~such a wonderful soul! I am a FFC subscriber. I would be the Lion, because he has the coolest costume. I would be Glinda, because she is my daughters favorite. I also am an email subscriber and like you on Facebook. I’d be the scarecrow – I like his song best “if I only had a brain”. I’d be the scarecrow, because I swear that after having two kids I don’t have any brains left! Dorothy! It’s the shoes, of course! I “liked” CTC’s Facebook Page! I would be Dorothy because I love her red sparkly shoes!!! I would be the good witch, because she’s nice.